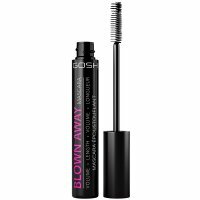 GIGI HADID - FIBER MASCARA - BLACK by MAYBELLINE. Mascara. It comes from a limited collection designed by Gigi Hadid - a well-known American model. Extremely lengthens eyelashes and adds volume to complement the distinctive eye make-up in New York style. The product consists of 2 unique tips. On the one hand there is a shorter brush with Fibers, which task is to add volume and length to eyelashes. On the other hand there is a flexible brush with black ink. The whole was placed in a solid packaging, well-lying in the palm of your hand. Does not stick and does not create lumps. Effectively lengthens and thickens hair. Directions for use: For best results, it is recommended to use a black mascara first and then a brush with fibers. Finally, cover the whole with ink for the second time.